and certainly some vanilla ice cream or whipped cream. Even the locals are bound to love this one. 1. 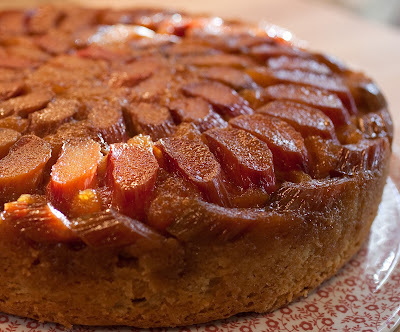 Grease the bottom and sides of a 9-inch-diameter-by-3-inch-high round cake pan (don’t use a springform pan; the caramel might leak out during baking). Line the bottom of the pan with a round of parchment paper, cut to fit, and grease the paper. 2. In a medium saucepan, combine the sugar, water and lemon juice. Cook over medium heat, stirring, until the sugar dissolves. 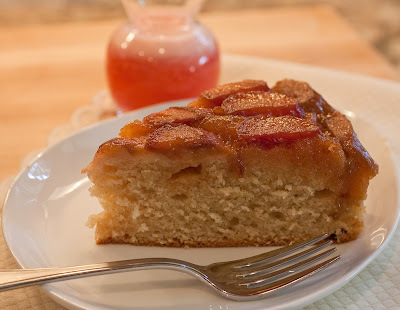 Stop stirring; increase the heat to high, and cook, occasionally brushing down the sides of the pan with a wet pastry brush to prevent crystallization, until the mixture turns into a golden caramel. Remove the pan from the heat and immediately whisk in the butter, one piece at a time (be careful: the mixture will bubble up furiously). Carefully pour the hot caramel into the bottom of the prepared pan. 3. 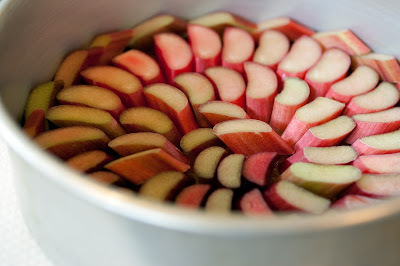 Arrange a circle of rhubarb slices, overlapping them slightly, around the outer edge of the pan, on top of the caramel. Arrange the remaining slices in the center, covering the caramel completely and overlapping the slices slightly. 4. Position a rack in the center of the oven and preheat to 350 degrees F. In a medium bowl, sift together the flour, baking powder, baking soda, cinnamon and salt. Set aside. 5. In a small bowl, stir together the sour cream and vanilla extract and set aside. 6. In the bowl of an electric mixer, using the paddle attachment, beat the butter at medium-high speed until creamy, about 1 minute. Gradually add the sugar and beat at high speed for 2 to 3 minutes, until the mixture is lightened in texture and color. Reduce the speed to medium and add the eggs, one at a time, beating well after each addition and scraping down the sides of the bowl as needed. At low speed, add the flour mixture in three additions, alternating it with the sour cream mixture in two additions. Scrape down the sides of the bowl and mix just until blended. Spoon the batter in large dollops over the peaches. Smooth the batter into an even layer. Bake for about an hour, until the cake is golden brown and a toothpick inserted into the center comes out clean. Set the pan on a wire rack and cool for 10 minutes. 7. Run a thin knife around the edge of the pan. 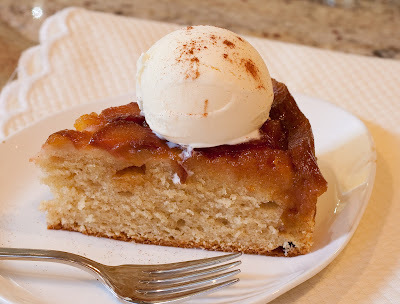 Using pot holders, very carefully invert the cake onto a cake plate or platter. Peel off the parchment paper, if necessary. Serve warm or at room temperature with vanilla ice cream or whipped cream.